SPOILER ALERT! 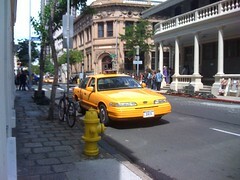 “LOST” returned to downtown Honolulu this morning to film a New York street scene. The intersection of Bethel St. and Merchant St. was converted into the Upper West Side in Manhattan, with a tell-tale subway entrance (“Columbus & 67th St. Station”), New York cabs, some news racks, and an antique rugs shop (“established 1902”). 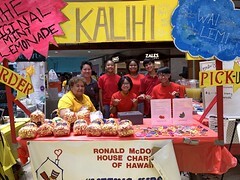 The centerpiece, though, was Honolulu’s upscale preschool, The Cole Academy. 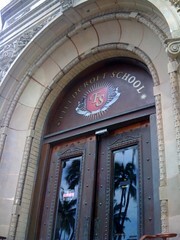 Through the power of quality set signage, its ornate entrance became the door to Fieldcroft School. 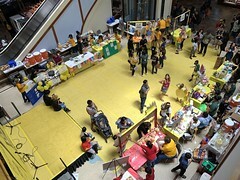 Students, perhaps in their early teens, stood around with their backpacks. Nearby, a limousine waits. The scene involves John Locke (Terry O’Quinn), Matthew Abbadon (Lance Reddick), Ben Linus (Michael Emerson)… and Walt Lloyd (Malcolm David Kelley). I missed Ben, but was able to catch Walt and Locke  still in a wheelchair  talking across the street from the school as taxi cabs and pedestrians streamed past. Eventually, some other kids near the entrance call Walt over, and Abbadon helps Locke get into the back of a black Lincoln Town Car. Locke has a blue cast on his leg, but is able to hobble over to the vehicle. The sidewalk was clogged with fans and onlookers, more than a few with cameras, so I suspect today’s shoot will be among the best documented in some time! what time is your lunch break in relation to eastern standard time so I know when to check for more updates? Too bad that you missed Ben. I miss the whole shooting, I only got to see the tail end when the crew was starting to take things down. I did get to see Locke with his leg cast on and in a wheel chair. I live on the Upper West Side of NYC and take the Red line or the Blue line every day. 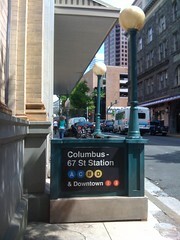 I can tell you that this subway station doesn’t exist. LOL.